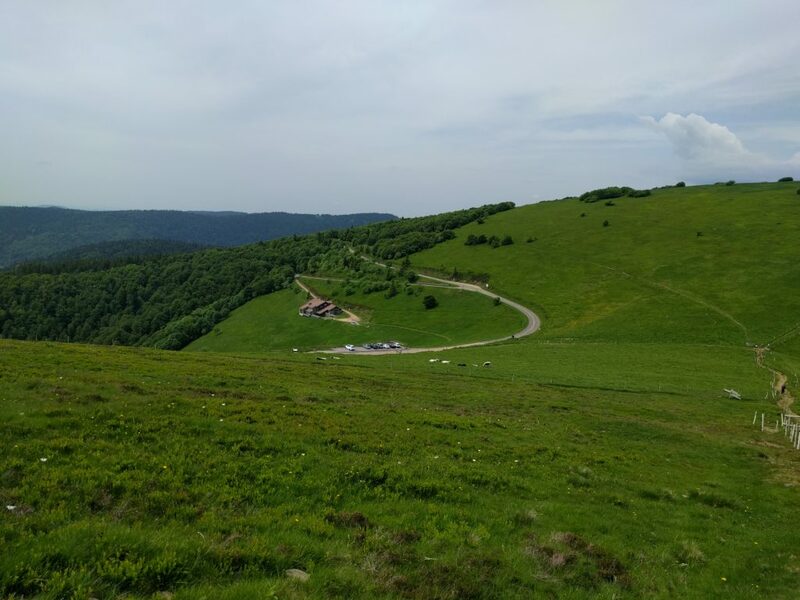 Before I post about the hills I’ve been climbing this weekend, I should probably explain why I’ve come to the Vosges, a very beautiful hilly area in Eastern France. 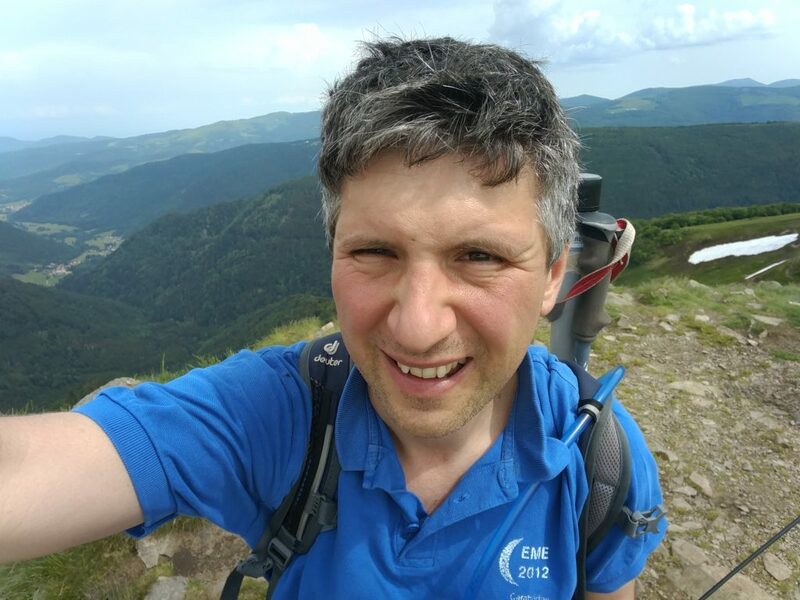 As you are probably aware if you’re reading this page, I participate in Summits on the Air (SOTA), an amateur radio award scheme for making contacts from summits. SOTA has a de-centralised administration model: so that a single team doesn’t have to classify hills globally, different ‘Associations’ administer the rules in their area, with that area often being a country or politically-recognised region. Generally, for a hill or mountain to count for SOTA, it has to have at least 150 metres of distinguishable drop (‘prominence’) from the summit point, such that rolling hillocks don’t count. This is the so-called P150 rule. But some Associations are in flatter areas, that wouldn’t have many qualifying P150 summits, and so those Associations may opt to adopt an alternative P100 (100 metres of prominence) rule instead. France is an interesting case in this regard, because the large mountain ranges (the Alps, Massif Central and Pyrenees) are all in the South and East, and so there’s a second Association (‘France – Low’), which is a P100 Association covering the North and West of the country. 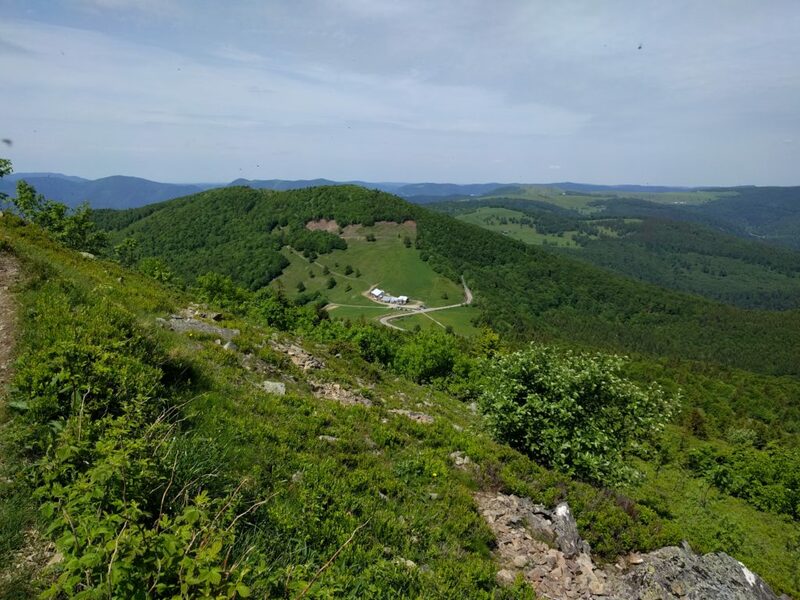 Due to the way the boundary between France and France – Low was drawn, the Vosges has ended up in France – Low, resulting in loads of easy 10-point P100 summits in a smaller area. Bear in mind that if you travel to other Associations, your earned points accumulate towards your score in your home Association. By travelling from England (A P150 Association) to France – Low (A P100 Association), therefore, any summits I activate here will count towards my English score, even though they are easier. 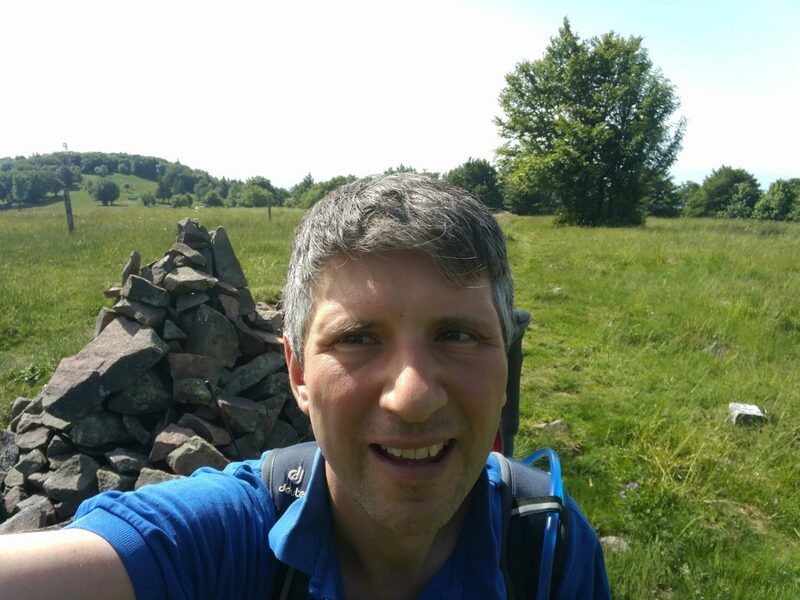 When I first spotted the Vosges anomaly on the map, I had to come here in a Bank Holiday weekend to see whether I could achieve what I thought was possible: 100 SOTA points in one long weekend. That would be almost impossible to achieve at home. I’ve come in late May not only because it’s a Bank Holiday but because many mountain roads in the area are closed in the winter by snow, so it needs good weather to attempt this challenge! I flew from London Heathrow to Basel Euroairport, which is actually on the French-Swiss border between St Louis (Mulhouse, France) and Basel, arriving on Friday evening. I hired a car from Avis via their tie-up with BA. If you try this too, it’s worth being aware that BA’s website can’t cope with the fact there are two Avis desks in two different countries in a single airport and so you get allocated the desk on the Swiss side of the airport. That’s fine but a recent EU customs rule apparently means that there are significant customs charges to take a Swiss-registered rental car into the EU, so you need to put in a special request for an EU-registered car. It sounds bureaucratic, but it worked fine for me, and just after 11pm we had a car. Because of the time, we stayed in the very nice surroundings of the Airport Hotel Basel, and then drove into France the following morning. My plan was to tackle four hills today, all of which are 10 points for SOTA. Le Molkenrain is the nearest to Basel, about 45 minutes of easy motorway driving from the border, and then just some twisty mountain roads for the last bit. 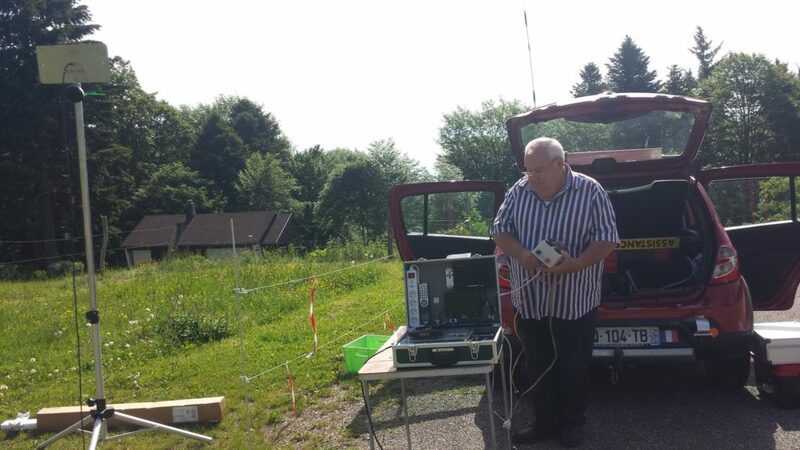 On arriving at the carpark, we found a local F4 station setting up some ATV equipment, aiming to get cross-band pictures on 13cm and 23cm to a repeater in Germany. The walk itself is easy, and took just over a quarter of an hour. It’s only about a 125m vertical ascent over about 1km horizontal and I reached the summit at about 10:30. 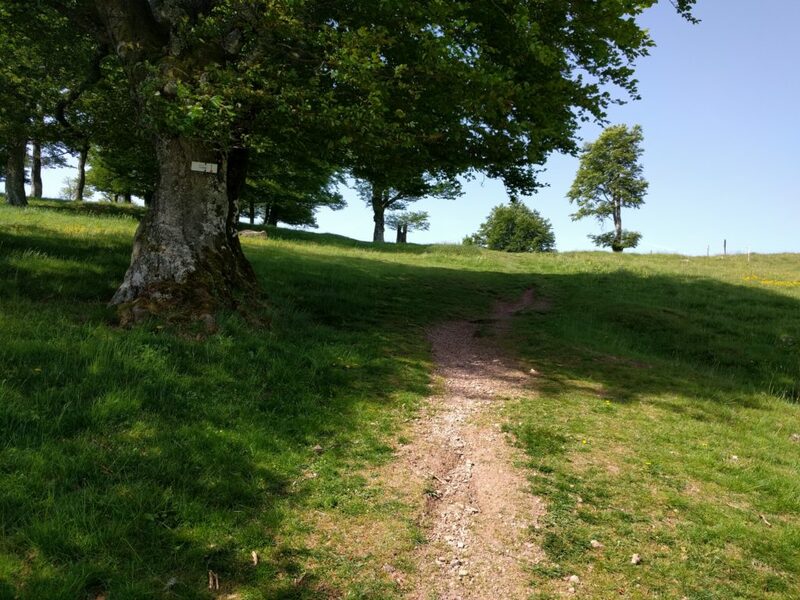 The path starts on the road, walking past the auberge (where public toilets are available), then cuts on a gently upwards path along the field boundary to the walker’s refuge. At the refuge, you turn right and follow the obvious path to the cairn. I set up on 30m CW and easily made 8 QSOs within ten minutes. A quick pack-up, and I was back at the car by 11:15. 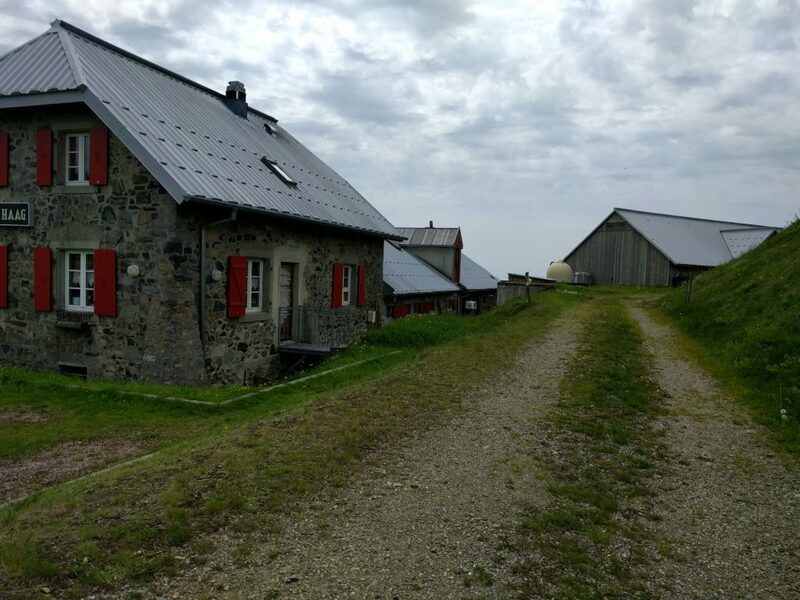 The Grand Ballon is about 30 minute’s drive from Molkenrain. It is a very busy site, with numerous restaurants in the carpark below the summit and, today, a lot of motorbikers using it. You certainly had to be alert when driving the hairpin bends, in case of a motorbike in the middle of the road around the corner. There’s building work taking place in the carpark at the moment, meaning that the start of the path was a bit hidden but I followed the sign to ‘Sommet Gr. BALLON par G.R.‘ (Summit via the walking route). The path is short, only taking about 20 minutes to climb the about 70m vertically from the carpark, over about 0.65km. The views over the surrounding hills are quite spectacular, and half-way up you get a nice view towards the Storkenkopf – the next hill on the route. On top of the Grand Ballon, turn left towards the cairns, rather than towards the golf ball. The cairns area is sadly a fenced square, with no access beyond the fence. On a busy day like today, there were lots of families taking photos within that fenced area, and so this made operating a little difficult. With some Sporadic E around, I chose to try 6m first as it needs less dipole length than 30m, but although the RBN saw my calls, I didn’t get any replies sadly. I think everyone was on FT8. While I was wondering what to do, the area became a little quieter, so I took the opportunity to move to 30m and made 6 QSOs. In total, I was on the summit for about an hour, taking me a little behind my planned schedule. Storkenkopf is just around the corner from Le Grand Ballon. 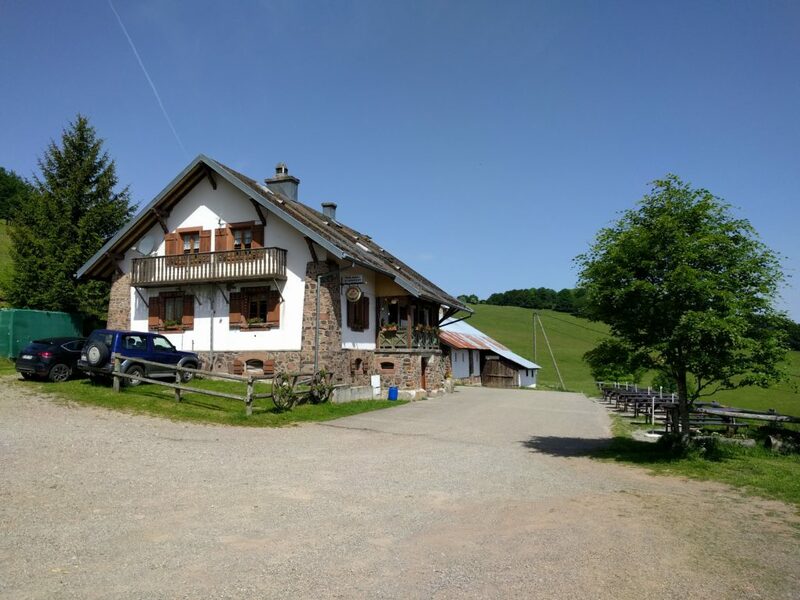 It would be easily walkable to go between the two, but since we would be driving past anyway, we parked at the Auberge de Haag at the bottom of the hill and I walked up from there. This is another fairly easy climb, starting from behind the farm and then you follow the marked path up the hill. 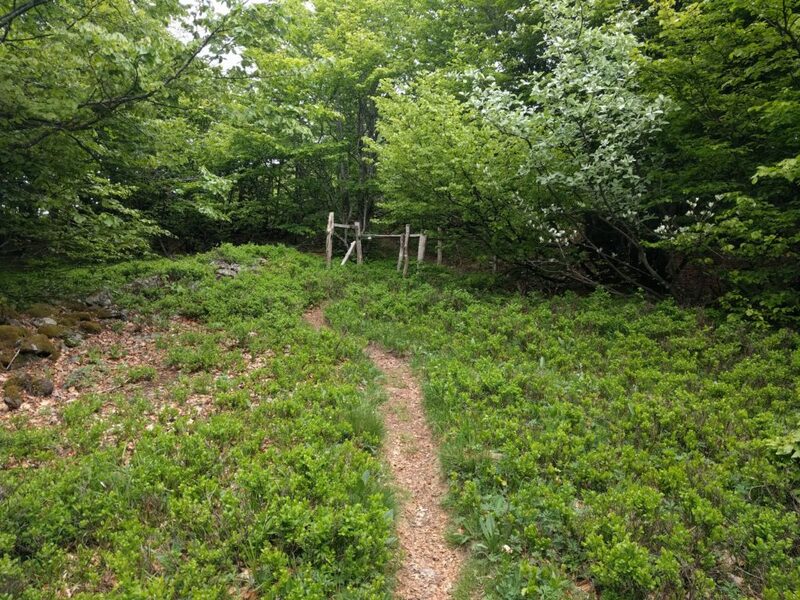 When you come to a clearing in the forest, turn right and head to the far corner of the clearing, to pick up a smaller path to the summit. The journey up took me about 20 minutes, and the descent about 15 minutes. 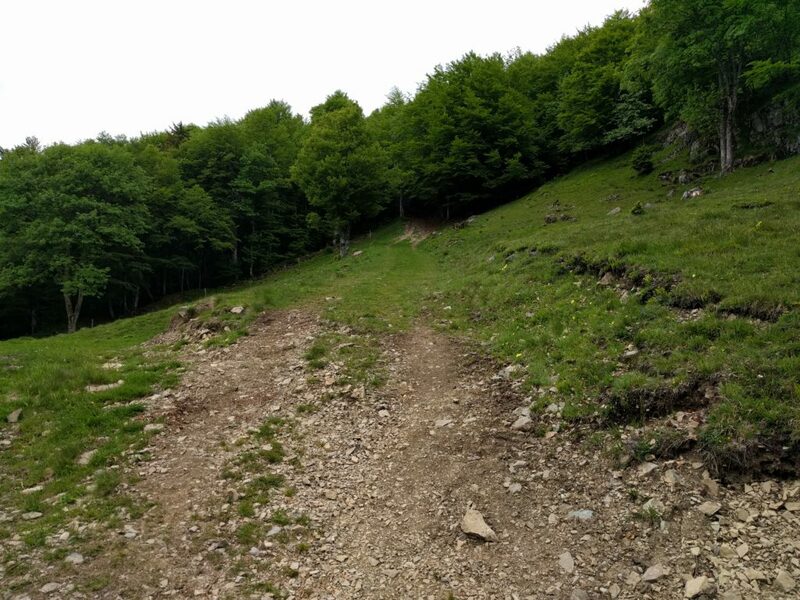 This hill is similar in steepness to Molkenrain, with 130m of ascent over a 1km. 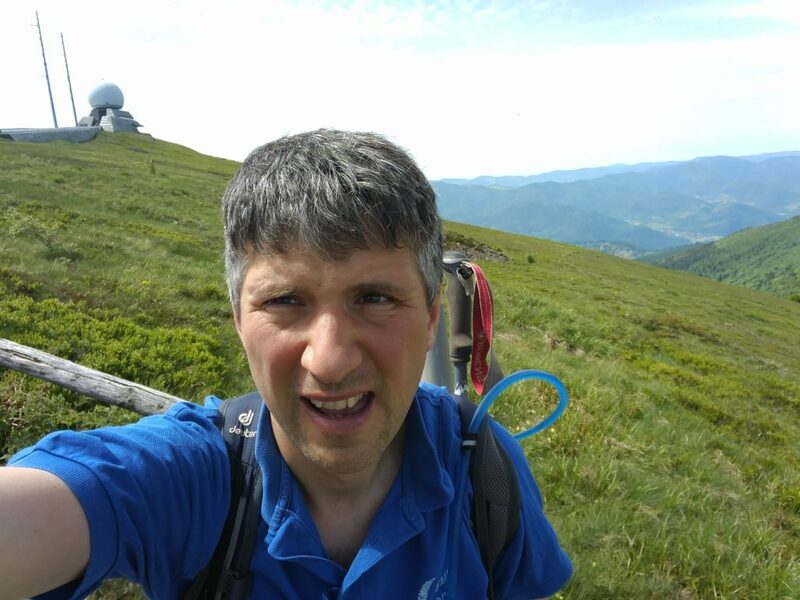 This was a very good location for HF – much quieter than Grand Ballon – with plenty of space for my dipole. I managed 15 QSOs in 20 minutes from here. About 30 minutes’ drive North of Storkenkopf is Rothenbachkopf. 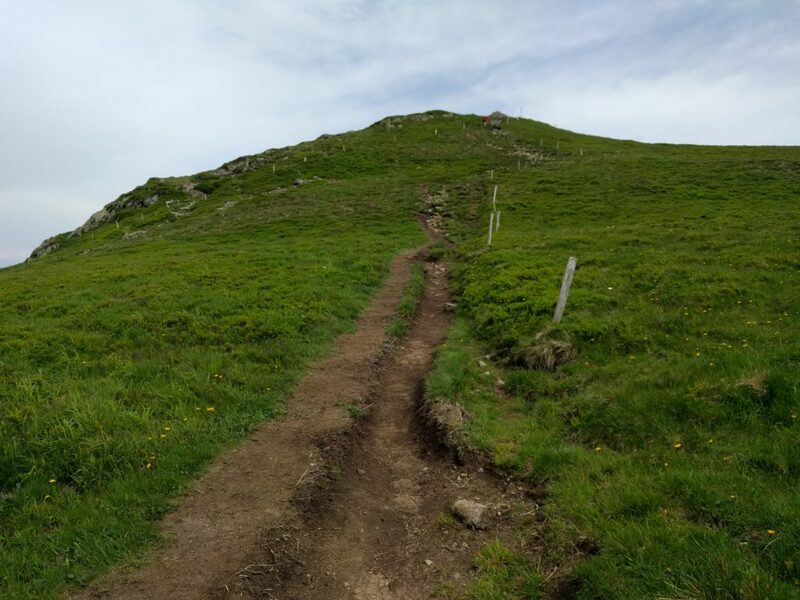 This is another easy walk, with a nice footpath starting at a carpark by the road, from where it’s about a 20 minute climb, ascending 100m vertically on a well-made path over about 0.8km, with a few steps leading up to the summit. 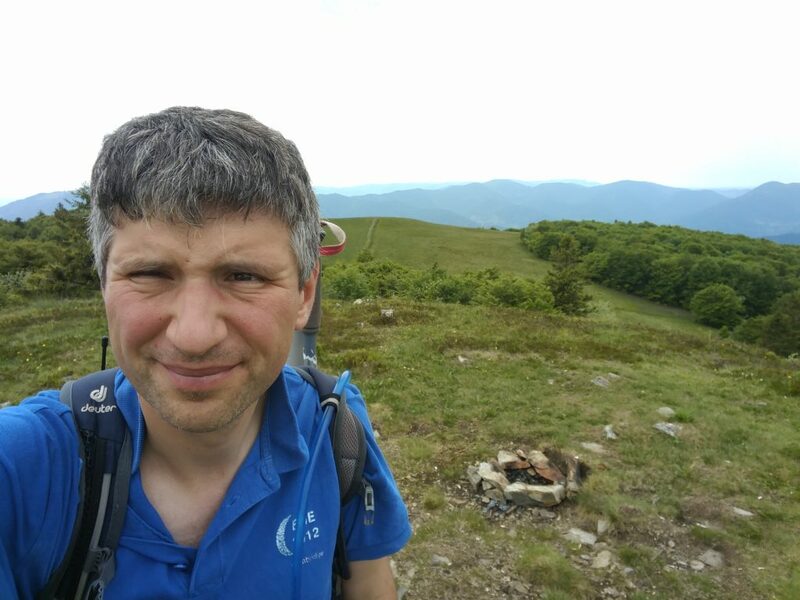 There’s sufficient flat ground around the summit to erect an HF antenna, and I quickly made the six QSOs I needed to qualify the activation, again all on 30m CW.